Minister of Textile Smriti Irani in conversation with the Editorial Director of New Indian Express Prabhu Chawla at Devi awards 2016 in Delhi. Minister of Textiles Smriti Irani in conversation with the Editorial Director of the New Indian Express Prabhu Chawla at Devi awards 2016 in Delhi. She talks about steps taken to improve conditions of weavers in country and new initiatives for textiles industry. Your journey from TV actor to an able administrator? One needs to recognize that it is very difficult to find women who are very blunt about their success. I see nowadays people try to gently put in words which might not be very patriarchly offensive. I am proud to be housewife but people say that to for it to be more acceptable we make the term homemaker. I am proud to say that I am part of administration. Honestly, ask any women she’s doing close quarter battles every day, the difficulty is that you are not battling enemies but your own people not strangers. There is a confidence that whatever may be the challenge, we will succeed. Whom are you having close battles with? When are we trying to ridicule, when I say that women are fighting certain battles at close quarters it is to define stories of successful women, it is far easier to do it in a family where almost every member is educated, I am talking today as women and not talking as a minister. If this is a stage to celebrate female achiever, I celebrate very women who is fighting that battle but not getting award for it. I think today amongst us those women who are fighting these battles and yet keeping their families together, keeping their dreams alive are genuinely big heroes. Margret Thatcher (former British PM) had said any women who understand the challenge of running a home is very close to understanding the challenges of running either a business or for that matter administration. I think if it resonates with Thatcher all the way upto India, they say that there are certain battles you fight only because of your gender. What you think Indian women can do to make our Indian brands famous? If I talk about textile as an economic sector then 70-75 percent of people employed in the sector are women. As a market the handcrafted legacy of India is something which actually cannot be measured in term of how rich its’ value will be pepped at an international arena. So we are quite blessed that we have a textile legacy, craft legacy in the country which many of us enjoy. You ask any lady who is part of textile sector or a man for that matter, when it comes to clothing, let’s say in France today there will be colour forecast for the year 2017-18 but no one would dare forecast a colour for this country because we enjoy our colours on our own; we enjoy the weaves and we enjoy the choices we make. What can you do for the sector? There is a much we have done from ensuring that yarn our weavers get the supply was only retained to certain offices. Nobody in this age of technology could actually empower the weaver to know that how the subsidized yarn supply will reach them. I am launching e-dhaga Monday (December 19) , which put the entire yarn supply for all weavers through an app in three languages in next two-three weeks. One of the major challenges weavers face is that they cannot afford new looms. For the first time 90 percent of the cost of loom will be borne by the government. Given the vibrancy of the sector, I not only have the challenge but also the opportunity to set lot of historical wrongs right. 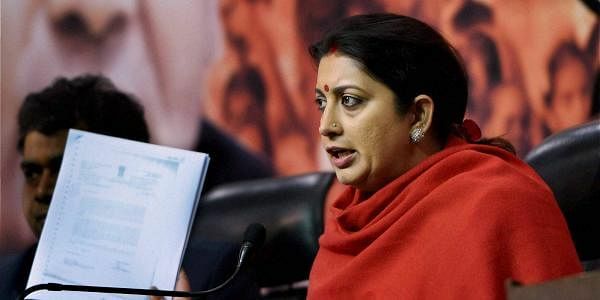 What is the difference between two ministries you handled HRD before and Textile now? I think that I never started wanting to prove anything to anybody. But I was just there to do my job which I did and when you do your job to proving anything then you do great disservice to responsibility that is being given to you. I remember walking into an IIT Council meeting and I asked why it doesn’t have a single women. I told them that I am here as virtue of my office and they told me there are not many women in technology who are part of IIT Council. I told them we have Tessy Thomas and then I inducted two women in the IIT Council. As a woman, what broke my heart was when I called Tessy Thomas and I said ma’am would you accept the position and she said you thought of me and I said why not you have done so much for the country. Why women are not trusted with important posts? Textile is an economic portfolios, commerce minister is also an important minister and equally the minister of external affairs minister, and these ministries are handled by women too.